Ascending Butterfly: Today's Words of Inspiration - Change Your Reflection! 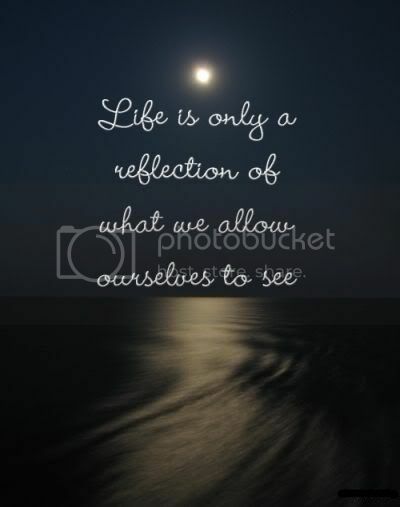 Today's Words of Inspiration - Change Your Reflection! What is your reflection saying at this moment? Unfortunately, mine would be the reflection of my computer monitor. And that's NOT good. I've spent way too many hours burning the proverbial 'candle at both ends' lately. (and by lately I mean this entire past 12 months!) So I've decided it's time to change the reflection! Is there somewhere you can go this weekend to change your reflection? To bring a better image into view? While I do beleive we can also blind ourselves with what we choose to NOT allow ourselves to see, the things that we choose to see and to fill our waking moments with are equally as important. It's easy to find ways to change our literal reflection, new wardrobe, new haircut, new makeup palette, but it's the internal reflection that shapes the external one. Take some time this weekend to change the internal reflection, to see something that makes you happy on the inside so you can then bring forth something beautiful on the outside! NOTE: I am OFF to take a bit of my own advice! There will be delay in entry approval/processing this weekend. You do NOT have to put in your comments over again. You do not have to email us. Entries will all be approved before business day close on Tuesday, June 8th. I hope you all take some time this weekend to allow yourselves to see and then reflect something beautiful! I see how if we believe...good things will happen. I see family members' health turn out to be better than we thought. Lots of praying and belief. I am heading off to go camping for a few days. What a great way to get close to nature and myself. I agree dor! Enjoy your camping trip! Getting close to nature is a balm for the soul. Sounds peaceful, what kind of things do you plant? What is your favorite flower? Mine is the stargazer Lily! Does your garden get Ƹ̵̡Ӝ̵̨̄Ʒ's? Good message, why then am I spending so much time on this website accumulating entries to the shoe giveaway? Discrepancy here. Good Question Betty! I would say it's because these shoes reflect something you currently wish to manifest, better fitness/health, and that's a VERY good thing!